Perfect as an appetizer, veggie side, or doubled up for a main course, this tasty combo comes together a lot faster than you would think. Preheat your oven to 400, halve and remove the seeds and stems from your red peppers, then rub them with olive oil and salt and place them skin side down in a large roasting dish. In a small bowl mix together some minced anchovy, one fillet per half pepper, minced garlic, and enough olive oil to form a mustard-like consistency. Spoon the mixture into the red pepper halves, and use a basting brush to spread it around. Roast for about 40 minutes, or until the peppers start to brown on the edges. While the peppers are cooking, stir together some ricotta, chopped basil, extra virgin olive oil, and coarse salt to taste. 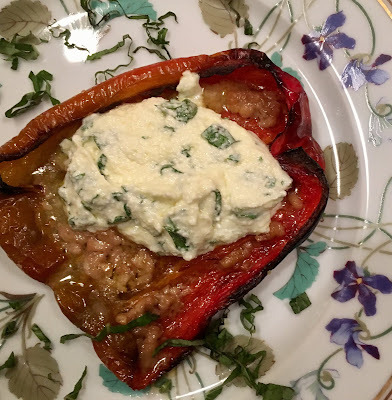 Serve the peppers either right out of oven, or at room temperature, with a generous dollop of the ricotta mixture.